BEST New Year's Eve EVER! Fun activities for the kids! BALLOON POP Countdown! 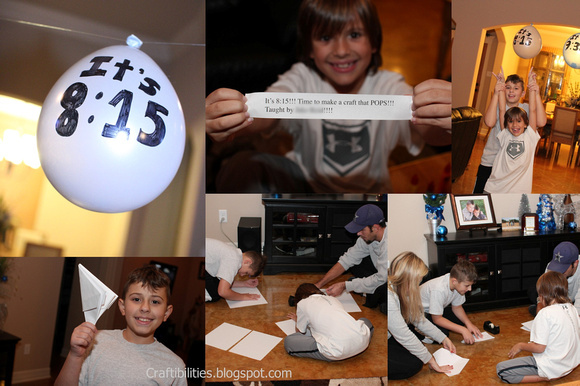 I didn't realize how much the boys would love the NYE countdown when planning this idea. 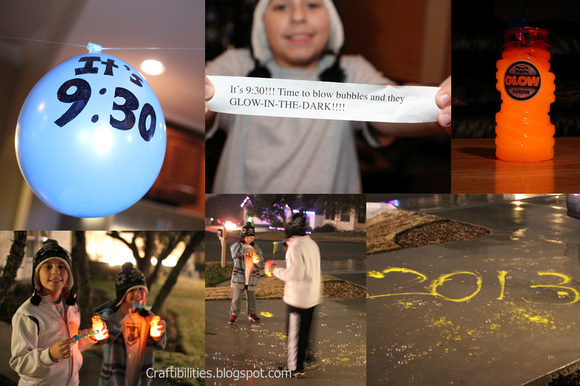 Such a great way to make New Year's Eve fun for the kids. Here are some of the things I planned and already thinking about next year. My boys are 8 & 10 years old and LOVED everything! 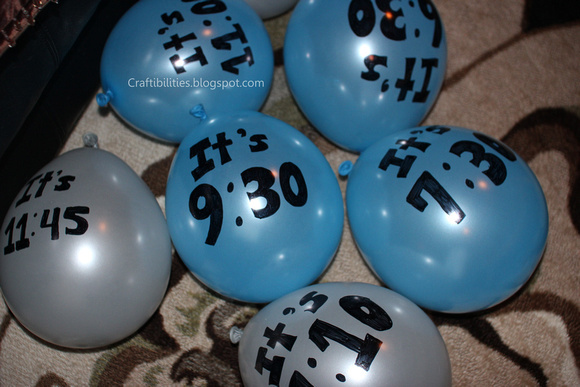 They woke up to balloons hanging across the ceiling and had no idea what was planned. The anticipation grew all day long until I got off work. First balloon pop at 6:30pm. The night before I put everything together after they went to bed. I printed the activities on a sheet of paper or hand write them. I cut each activity into strips and rolled. The hardest part was remembering the time so I could write it on the balloon. I ended up poking a hole in the balloon, not to pop it and wake everyone. I set it down while the air released slowly but my cat thought it was attacking her. She ran into the leg of the table knocking over Christmas decorations while she attacked it back. So much for being quiet. 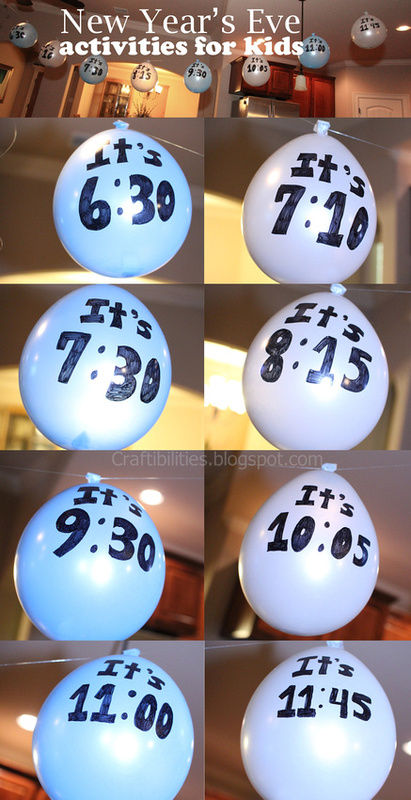 I used a sharpie to write the times on the balloons and planned how to hang them. I didn't want to make marks on the walls. Since there wasn't much weight to the line, I used fishing line from a ceiling vent to the cord on the ceiling fan. Worked out perfect! I added the balloons with tape. 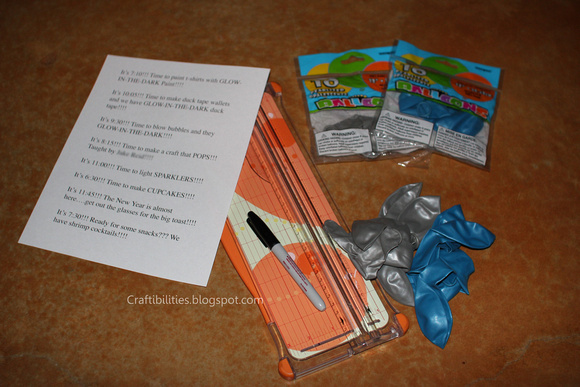 It was easy to slide each balloon on the fishing line to space them out. #1 - It's 6:30! Time to make cupcakes! Remember the subway art and tags I posted a could days ago? They were perfect to decorate some of the cupcakes. #2 - It's 7:10! 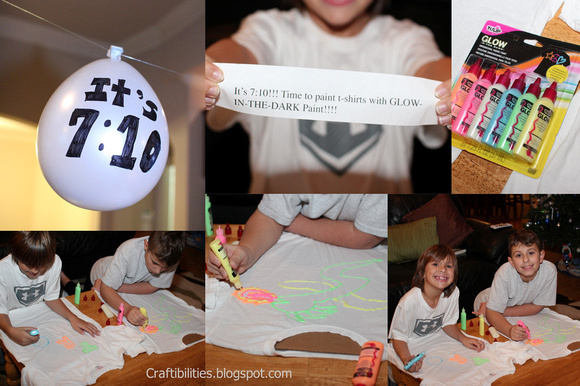 Time to paint t-shirts with glow-in-the-dark paint! I found fabric paint and t-shirts at Michael's craft store. #3 - It's 7:30! Ready for some snacks? We have shrimp cocktails! My boys LOVE shrimp and this is considered a fancy treat. It's been a NYE tradition for years. #4 - It's 8:15! 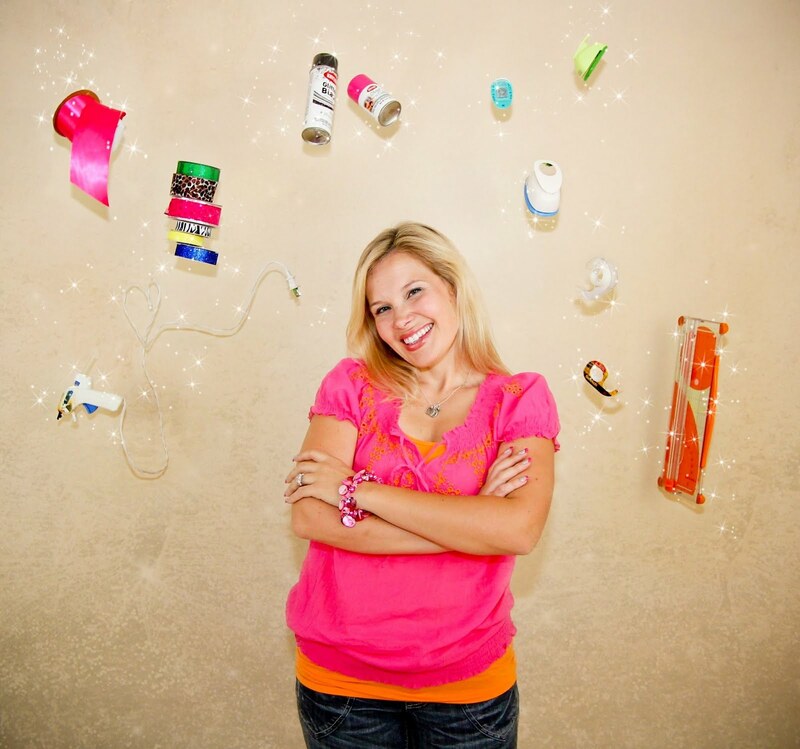 Time to make a craft that POPS! I ask my son a few days before if we could make homemade poppers on NYE and would he teach us. He didn't know it was part of the countdown. He did such a great job finding and teaching this craft. We each had a different idea about creating a NYE popper. I thought about twisted paper filled with confetti. When he demonstrated this triangle piece of paper I was amazed. It made a huge pop noise. So cool! #5 - It's 9:30! Time to blow bubbles and they glow-in-the-dark! Glow in the dark bubbles looked cool but the bubbles didn't really glow. Instead the boys had fun with the glowing liquid. 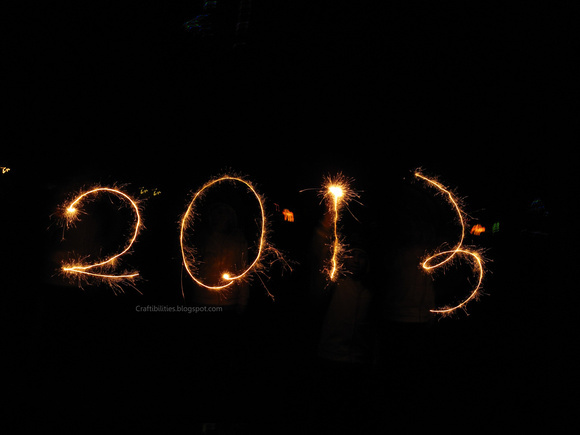 They wrote their names and 2013. #6 - It's 10:05! 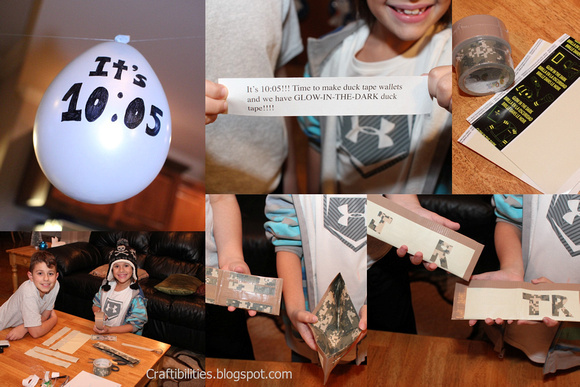 Time to make duck tape wallets and we have glow-in-the-dark duck tape! #7 - It's 11:00! 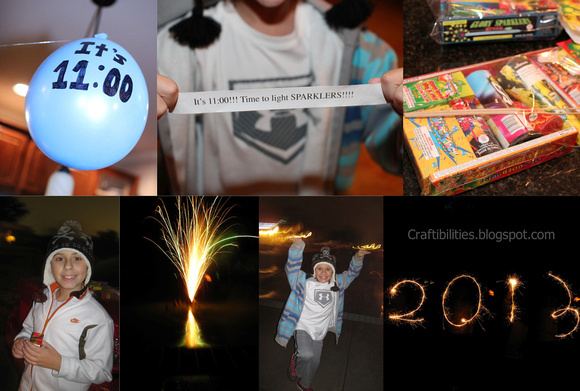 Time to light sparklers! 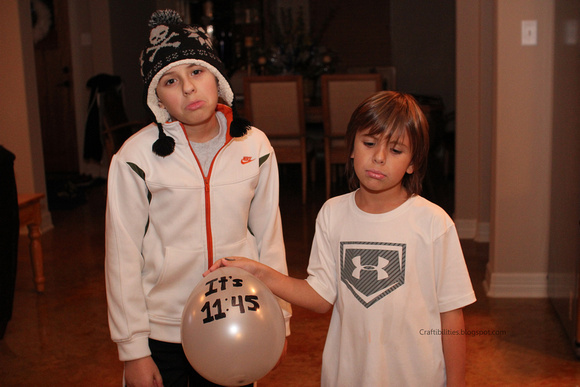 I picked 11:00pm in case they didn't make it to midnight. I had no idea they would be excited for each balloon and wide awake. A little light painting fun with sparklers. And finally the last balloon. They were so sad because they didn't want the fun to end. It's 11:45! 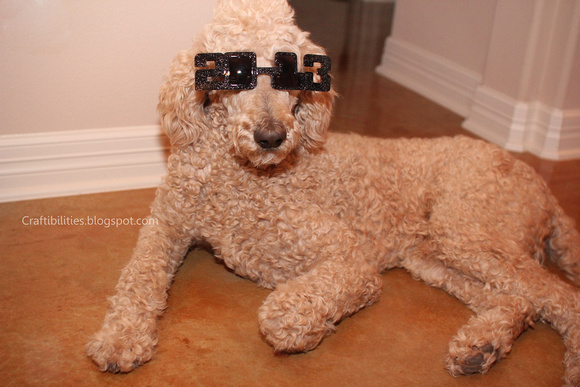 The New Year is almost here.....go get the glasses for the big toast. We had champagne and they had apple cider. Happy New Year from Rolo! Wishing everyone a very Happy New Year!!! And it's now a tradition!!! 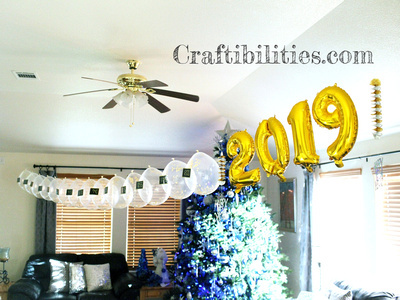 2018 NYE Balloon Pop Countdown IDEAS - Fun games, activities, photo booth and MORE - Family tradition to bring in the New Year! I am so glad to have found this great post! 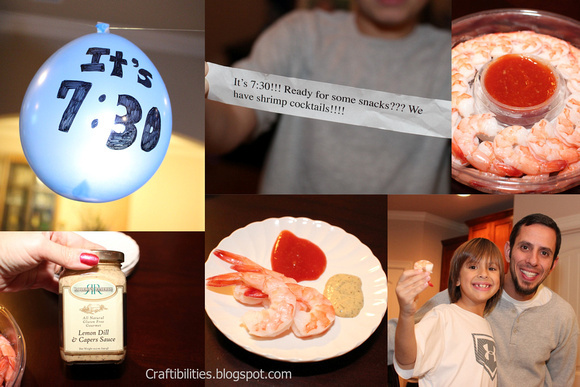 Thanks for sharing these great New Years Eve Ideas! 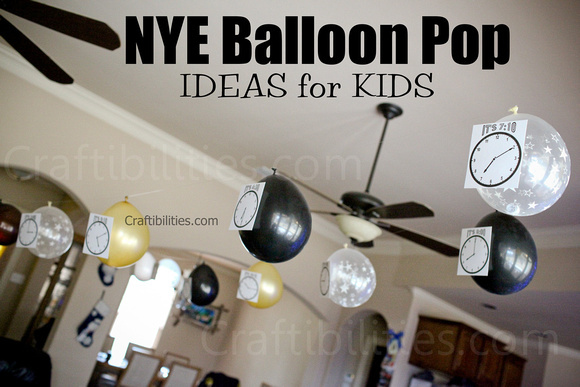 love the balloon pop idea! thanks!! nice work. I'm planning it out right now!! Thank you! Glad this could inspire! Awesome! Your ideas are so thoughtful.....love love love them. Thank you very much! I appreciate you taking the time to comment! I LOVE this! My kids are still really young, but I'm definitely going to do this in a few years. Going to share this on my blog though for sure!! 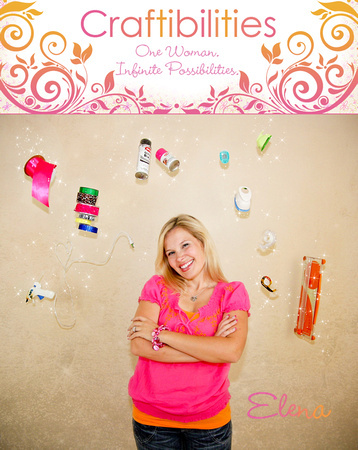 Wonderful fun ideas! Thank you very much! When my kids were younger and couldn't stay up I use to do a count down at noon instead of midnight. This way they could join in the celebration. Thank you for stopping by! Congratulations! Your post was featured on my blog! Please stop by to check it out and grab your "I've Been Featured" button. Awesome! Thank you, Amy! I appreciate you sharing! This is such an awesome idea!! I just printed my list of activities and will get my items later tonight!! Perfect family activity especially allows for the inclusion of the smaller kids when it's only adults and older children!! Thank you for such an awesome idea!! Thank you, Wendy! I'm so glad this was helpful and excited you are trying it too! Thank you for the very sweet comment and taking the time to post. Have a Happy New Year! Absolutely! Thank you for taking the time to comment and have a Happy New Year! Great idea!!! found this post through pinterest, and I am SO excited to do this with my family! 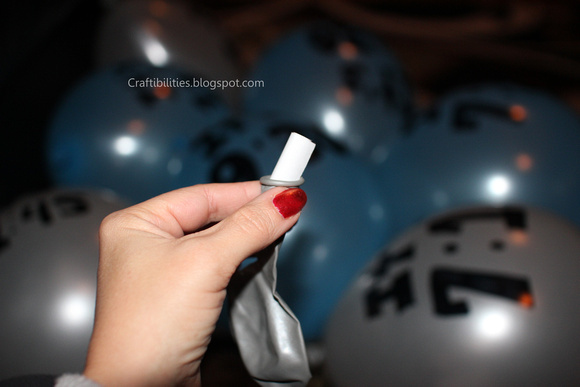 Do you have directions or a link to how to make the NYE paper popper? :) Thanks so much! Thank you, Chris! I'm sorry I didn't reply sooner. I totally forgot to post an update about the popper until your comment. I need him do a tutorial for the future. I hope you had a fun evening NYE! Happy New Year! Thank you so much! I appreciate the sweet comments and thank you for stopping by! Thank you! Makes NYE go by so fast and absolutely no sleepy heads going to bed early! You do not know how grateful I am for finding this. I am the "babysitter" this year for the adults and I will have 8 kids ages ranging 2 - 10 years old. This is just perfect. Yay! I'm so excited! Thank you for visiting and the feedback! I usually work NYE but have off this year so I think the festivities will start MUCH earlier this year. Oh the boys will be so excited! thank you for the wonderful post! this would be so much fun to do with the kids. I know that this will make new years so much fun for the whole family! Thank you so much! I appreciate you stopping by and leaving such a sweet comment! Thank you for posting this! 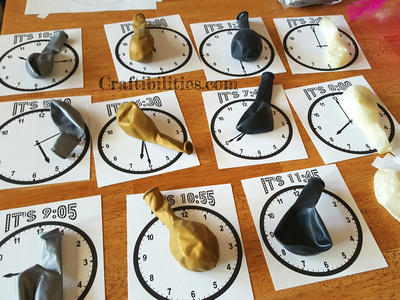 I'm super excited to do this with my kiddos this year (ages 8,6,4,&4) I love how I can adjust it to fit our family... we celebrate with the kids EST instead of our PST so they don't stay up too late. :) Also, I'm really allergic to latex so although I was bummed at 1st, I'm going to try and use small brown paper bags and blow them up instead. Yay! Again, thank you! Have a wonderful New Year! I am so excited you stopped by and thank you for commenting. I didn't even think about the latex but love the idea of the paper bags. Hope you had a wonderful NYE! Thank you! Thank you! Never a dull moment with cats. Thank you for stopping by and taking the time to comment. Happy New Year! Thank you! I appreciate you taking the time to comment and love the feedback! Oooooh love the dance party. Get the energy out and great family fun moment for sure. Hope everything turned out wonderful! Happy New Year! I'm so in love with this idea!!! Thank you for posting it! Thank you so much! Glad you stopped by and thank you for commenting. Happy New Year! I am printing my labels now! 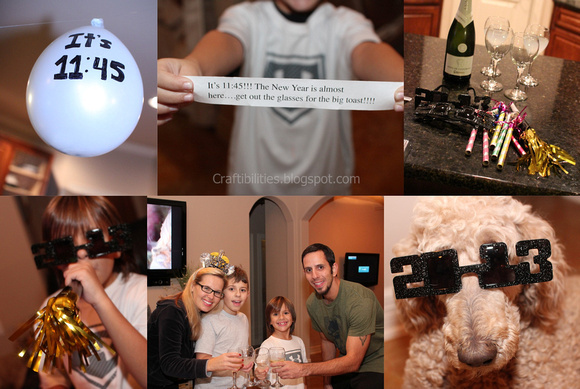 This is such a great addition to our family's NYE celebration! Thanks for sharing this awesome idea and I hope you have a very Happy New Year!!! Yay! So glad this helped. I appreciate you taking the time to comment! Thank you! Hope you had a wonderful NYE! Happy New Year! I'm 72 years old, but I wish you were MY mama!! Love that! Thank you for the smile. Happy New Year! 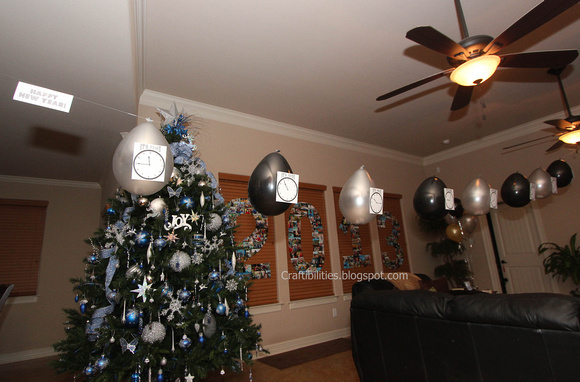 We did this last year for our family gathering (we celebrate Xmas on NYE). It went over so well the kids were talking about it for most of the year! We did other activities including twister, decorating a gingerbread house, some wii and PS3 games, etc. 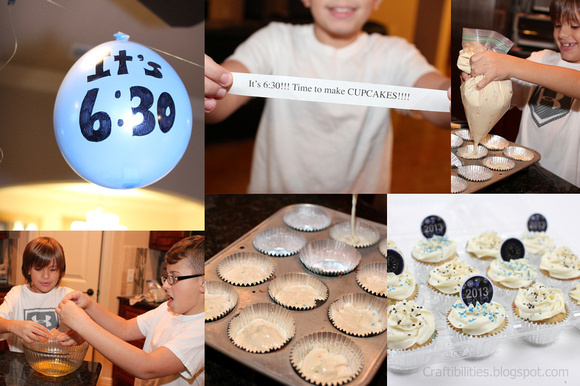 This year we are planning on doing a dance party, sparklers, decorating caramel apples and more! Thanks so much for this idea- our family loves it and we plan to do it for years to come! This makes me so happy!! I'm actually sitting here thinking of some new ideas this year and you listed so many great ones. Thank you for sharing! I really appreciate you taking the time to comment and the great feedback! I always have a NYE celebration with my grandkids. It gives the parents the opportunity to have quality time after Christmas. 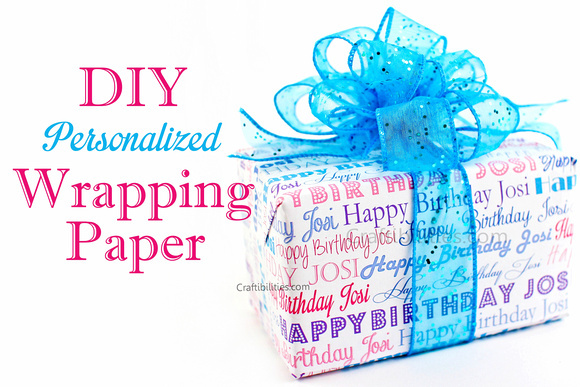 I normally fill a large plastic trash bag and fill it with balloons and and strips of construction paper and tie it to the celing to rip at midnight. This will be my new tradition instead of that.....lol Thanks for the wonderful and much more easier fun idea. Thank you! It's fun to change it up each year. Thank you for visiting my blog!